The Fitness Industry has grown by leaps and bounds in the last three decades. Brands that manufacture fitness machines come up with such innovative ideas that instead of people paying high monthly fees for gym memberships, they can actually do all the exercises of a gym in the comfort of their rooms. The Revolution Home Gym is a masterclass piece of equipment that brings almost the entire exercises of a gym into your own home. It not only meets all your fitness needs but also grants you the option of performing both cardio and muscular workouts in order to tone different areas of your body. The Bowflex Revolution is so versatile that writing down an entire list of things you could do with it would take hours to write. Most importantly it features SpiraFlex technology, a state of the art technology that was originally developed for NASA so that astronauts living in the International Space Station could maintain their physical fitness even in places of zero gravity. Unlike traditional home gyms that use cables, rods, and weights for resistance, the Revolution Home Gym provides a fluid and consistent resistance throughout the entire range of motion. It features two independently movable arms that can be adjusted by 170 degrees allotting you the option to try out as many different exercises as you can. It also has 220 lbs of weight that can be transformed into double the resistance (440 lbs). The amount of freedom and innovation that the Bowflex Revolution Home Gym allows you truly makes this a fitness machine for the ages. Stay with us and read on why this machine is worth your buck. The Bowflex Revolution Home Gym has the following dimensions of 112 inches x 38 inches x 73 inches of length, width, and height respectively. When assembled, it is pretty huge standing at a workout area of 10’ x 7’ (120”x84”) but can be folded to a relatively compact size of 55” x 38”. The large size of the machine can be a bit problematic because it covers a lot of space and is not feasible for placement in smaller rooms. But if you have a spacious workout area where you can fit the machine in, the issue of size will not be something that you’ll need to worry about. And now we head to the section of the features which is going to be quite a task to write about. Specifically because the Bowflex Revolution Home Gym is packed with so much features to mention that the prospect of even doing so is intimidating to say the least. The machine itself is capable of over a 100 exercises with so many variations that the number exceeds 400 types of workouts. It can boast a maximum weight resistance of 300 lbs for upper body workouts and a whopping 600 lbs for lower body workout routines. Imagine the possibilities that can be attained with having such a machine at your home. The arms of the Revolutions can move independently with a total of 10 possible positions which can also be adjusted by 170 degrees. This freedom of arm movement means you can adjust the arms to any specific position you desire and latch yourself on to, thus giving yourself varied, diverse, and plenty of upper and lower body exercises. One of the glossiest and highly effective feature that the Bowflex Revolution Home Gym is marketed with is its use of the patented SpiraFlex technology. As mentioned in the overview section of this article, the SpiraFlex technology was originally used by NASA in order to help their astronauts (floating in space, mind you) to be able to work out. Since the idea of lifting free weights in a zero gravity environment is next to impossible (keeping in mind the fact that weight is measured as the force acting against gravity), this innovative SpiraFlex came into being in order to make the workout possible. SpiraFlex technology is high-level and state of the art because it features plates – which actually resemble weight plates in gyms – that incorporate built in elastic straps providing designated resistance through each range of motion. This ingenious design allows you to work up to 220 lbs of resistance. The machine can further be upgraded to 300 lbs by adding extra 80 lbs of plates. This is easily Bowflex’s best selling point for the Revolution Home Gym. Moving onwards, the Revolution Home Gym provides you the ultimate total body workout as its careful and meticulous design makes it possible to target every core area of both your upper and lower body. Not only does it tone individual muscle, but it also burns calories faster and at a much more effective rate than any other usual home gym. Most home gyms focus more on upper body workouts but the Bowflex version also cares for your lower body workouts. 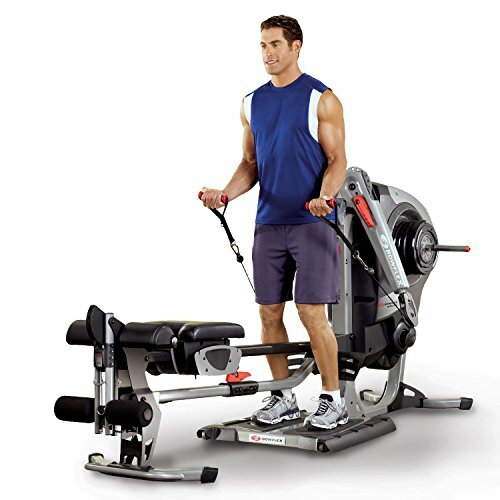 It uses not only leg extensions but also comes with a leg press station as well as a built in rowing machine. These nifty features make it possible to tone leg muscles and hamstrings to become stronger and sturdier. As I mentioned, the possibilities one can attain with this home gym are far too many to make it humanly possible to note down. You can view entire catalogs of things that can be possibly done with this machine in question. The maximum weight capacity that the Bowflex Revolution can accommodate is 325 lbs which is pretty good enough as it paves the way for overweight people to get on and quickly lose the extra calories. Finally, the machine comes with a pretty decent warranty of 10 years. That should clear hesitations (if there still are any). We’ll be honest here, the Bowflex Revolution Home Gym is heavy and not very easy to set up on your own. Sure, it comes with an instructions manual that is articulate and well written enough to help you understand the theory behind how it is to be set up but because of its heavy weight and large size, you may or may not need at least one or two extra people helping you out if you want to assemble this machine within an hour. Other features included alongside the user manual is a fitness manual with a catalog of workout routines and fitness tips that will highlight the possible exercises that can be done on this brilliant machine. 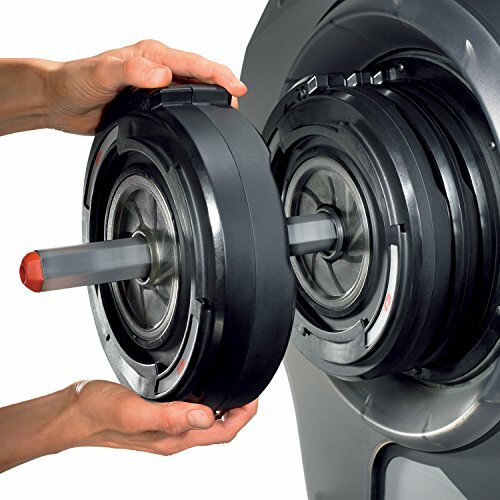 The Bowflex Revolution works pretty well on its own and does not require any high degree of maintenance. However, in order to stay on the cautious side, it is suggested you put this home gym on top of a rubber mat or a carpet. Honestly, if you’ve read this review all the way to the end, there is literally nothing more we can persuade you with. The Bowflex Revolution Home Gym more than speaks for itself as it compacts all the possible workouts of a gym and puts it inside one machine. You will never get tired using it since the over 100 exercises allows you to try possibly every exercise there is. Fitness machines do not get any better than this. If you have the money, you really should stop thinking anymore and go for this home gym ASAP. Honestly, this isn’t just a purchase but a real investment for a healthier, fitter you. Bringing all possible features of a home gym to one machine is a mind-blowing prospect. The resistance weights and SpiraFlex feature is revolutionary and even NASA training incorporates its use.